As soon as I was in the line outside The 1865, I got the sense that there was something extra special about tonight’s show. Modern Baseball have grown a reputation as having a strong connection with their fans, a sense of being there for each other and having a bond deeper than just being a fan. 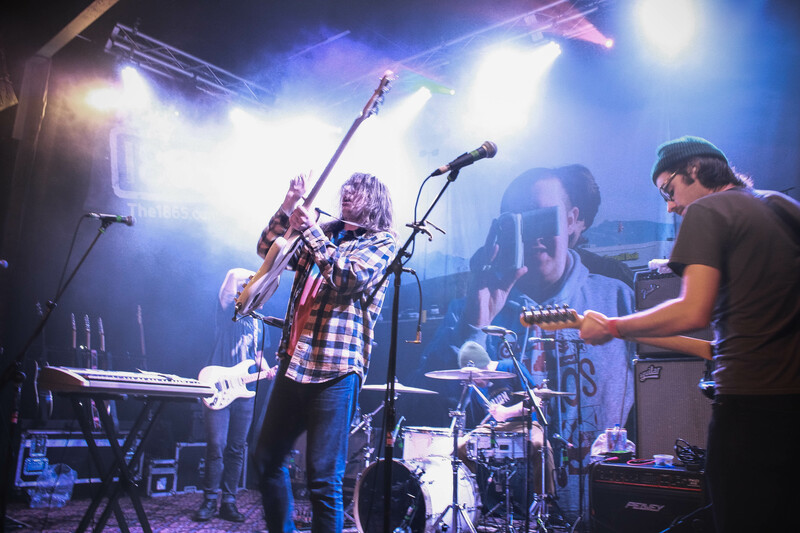 To be a Modern Baseball fan feels like being part of a family. 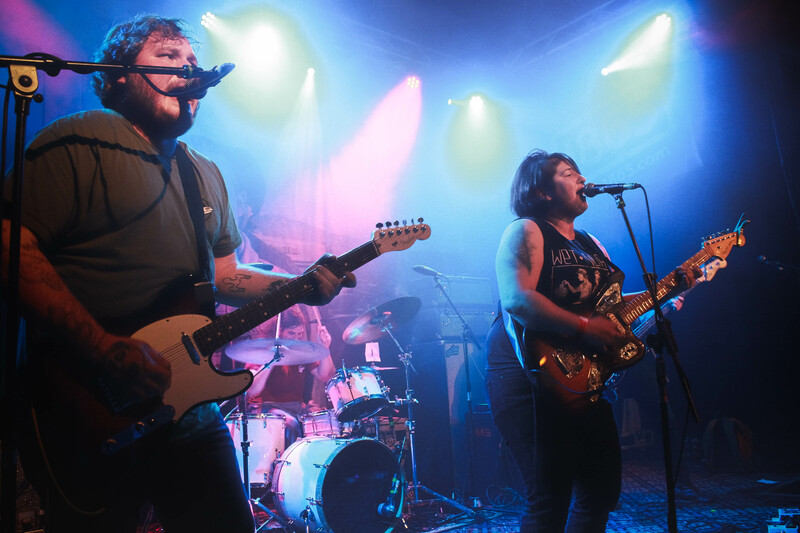 With a thunderously heavy set, The Superweaks stirred up the excitement for the show with ease. Set to a romantic taco dinner between Mike Bell and Modern Baseball bassist Ian Farmer (who could also be seen mulling around the crowd before hand) and waited on by Pikachu, The Superweaks brought huge tunes in the form of ‘Kick It’, ‘Frances Quinlan Will Have Her Revenge On Philadelphia’ and ‘Better Heavens’, ending the set with distribution of said tacos to those in the audience, broadening those smiles. Given that this is just their first UK show ever, it’s only a matter of time until these guys are headlining their own show of this magnitude. Following on from the great opening, Thin Lips took to the stage. Lead singer and guitarist Chrissy gave a short yet impassioned speech early on, apologising to any members of the LGBT+ community on behalf of their newly inaugurated President, saying that all she can do to fight it is to continue doing what she does, dedicating a song to the cause. 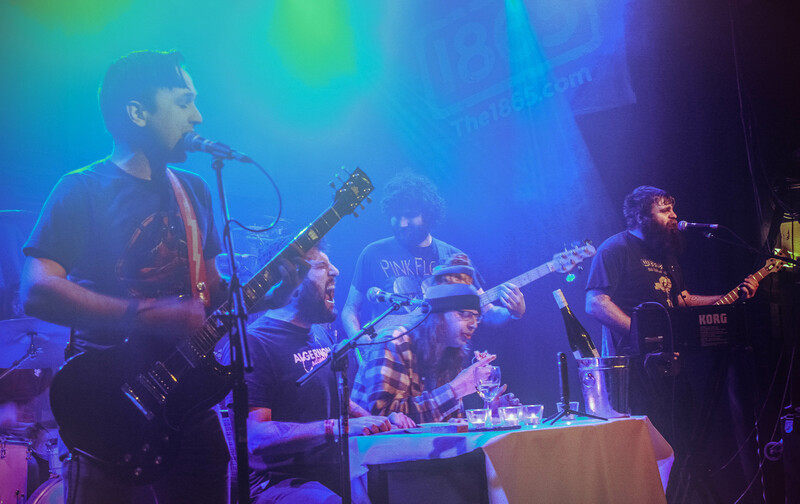 The band bring a great energy with songs like ‘Never Again’, ‘My Mouth Is Skinned Like An Apple’ and ‘Not Losing Sleep’, joining The Superweaks in heaping praise of the first place they went to when they arrived here in England – a Weatherspoons. They just ooze charm and charisma, strolling across the stage with confidence as if they’re playing in their own backyard. 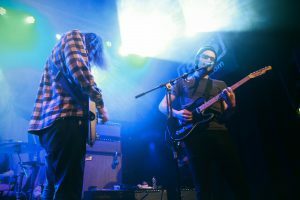 Taking to the stage after much anticipation, Modern Baseball blasted through a set full of bombastic tunes and huge sing alongs. Opening with a selection of tunes from latest album Holy Ghost, including ‘Wedding Singer’, ‘Note to Self’ and ‘Everyday’, they whipped the crowd into an immediate frenzy. But it was the older tunes that exploded many a mind, as the band launched into ‘Tears Over Beers’ and ‘Apartment’ to a staggeringly passionate reception. In amongst all of the excitement and adrenaline, the band took a moment to acknowledge the absence of singer/guitarist Brendan Lukens who chose to stay home to focus on his mental health. It’s common knowledge for their fans, and they responded just as positively to the band’s tribute as they do their music. Did I mention that the band-fan relationship is much more like a family? Yeah, this just proves it. Whilst the other band members stepped off the stage, Jake Ewald turned things down a notch and played a short acoustic set, bringing out old fan favourites ‘Cooke’ and ‘Coals’. As the full band returned to the stage, they picked a fan out of the crowd to sing on early hit ‘The Weekend’ and the night found its new biggest response. Chris Diehm of Thin Lips joins the lads for ‘Rock Bottom’, bouncing around the stage and playing the crowd with Jack Black-like charm and charisma. Chrissy returned to take over vocal duties on ‘Apple Cider, I Don’t Mind’ and the impassioned ‘Just Another Face’, the latter, a powerful song about mental health and self-worth, leading to a powerful chorus of voices exorcising their difficulties in unity with the band. The party only got wilder as the band headed into overdrive with their big hitting ‘Your Graduation’. Before they officially closed out proceedings, the band jam with a reggae style song used to thank and pay tribute to those who made the night possible, Farmer doing so in slam poetry fashion as he reads off a list of people, places and things. Part one ends as the band launch into their final song, a cover of ‘When You Were Young’ by The Killers, which the crowd enjoyed. As the people pour out, head of Philadelphia label Lame-O Records, Eric Osman distributes free sample CDs from the label, which includes tracks from the night’s bands. I thanked him for the CD and the work he’s put in to help nurture some amazing bands and create the most exciting independent music scene on the planet. You’ll be hard pressed to find a tour that packs this much fun and excitement into one night. A showcase for Philadelphia’s young and promising bands and a sign that this family is going places, Tourope (as named by the bands) is a total success and Modern Baseball prove that they are among the best rock bands out there. Modern Baseball are continuing their UK tour until February 18th, tickets are still available here.